Q. It's a different game, because this is a clinching game. How much does the message change to your players on a night when the Cup could be won? COACH MICHEL THERRIEN: Obviously I'm not here to lie. It's an important game. But for us, all our focus has to be on tonight's game. We can't look at what's going to happen tomorrow. It's a Game 7 for us. And we've got to make sure we're going to leave everything on the ice. But the most important thing is their focus. I know we've got to make sure we play in our structure. Even if the result was not there last game, I really and truly believe that we played a solid defensive game. We didn't give those guys a lot of scoring chances. You can't judge on shots all the time, because they take a lot of shots from everywhere. They're not quality scoring chances. I thought we played pretty well. Our structure was there. And our focus is going to be crucial tonight. Q. Can you afford to be more aggressive in terms of trying to get the matchups you want on the road, get Sidney away from that line? Do you want to get him away from that line more than you did in the first two here? COACH MICHEL THERRIEN: It's a fine line. It's, like, every time Sidney is going to be on the ice, if they're going to have their matchup, I'm not going to ask our top player to leave the ice all the time. That's what I mean. It's a fine line. So we've got to make sure that we don't have the last change. It's never easy to put the matchup, this is where the home team got the last change. And it should be like this. But it's never easy, and we're going to try our best. Q. With that said, do you utilize your go?to guys, the guys that have gotten you here all year, do you try to utilize even more? Do you double shift the Crosbys and all those guys, because there's no tomorrow, perhaps? COACH MICHEL THERRIEN: One thing, we've got a team concept. And that's the number one reason that we're here. We believe in our team concept. Our team concept brought us to the Stanley Cup Final. Our team concept helped us win the division, because without any team concept, without the amount of players we lost through the course of the season, important player, we wouldn't have been here. That's a fact. And working with that team concept for two years. And we believe in our structure. We believe in our system. And we're not going to change, like this (snapping fingers), that's not the way it works. So it's our responsibility to try to bring the best of the players, and a guy like Crosby, I believe he's playing great. He's playing great. And he's got energy. For me it's important for him to get energy when he's on the ice. Because if he doesn't have that energy, it's going to be difficult for him. So that's my responsibility, that every time he steps on the ice, the tank is full. It can't be half full, because he won't be able to succeed. Q. Is there anything you can do differently tonight to try to get Malkin going; you personally, as his head coach? COACH MICHEL THERRIEN: I would try. The only thing you can ask from a player is to make sure he's working hard, to make sure he's focusing on the way he's supposed to play. If he's going to have goals, he's going to score some goals. The most important thing, I never ask any players: We need one goal from you, we need two goals, we need three goals. That's not the reality. The reality is, you want your players to work. You want your players to work in the structure. And some players got more ability to be more creative. But on the other end, we wish ? the poor kid, he feels the pressure. There's no doubt. He's a great kid. The last two games, I thought he worked hard. But right now, not much is happening for him. And he's got all the support; he's got the support from his teammates. He's got the support from the coaching staff, as long as he's working. I thought the last two games he worked really hard. He skated well. And why don't we give credit to the Red Wings. They're a good checking team. And both teams, last two games, they checked really well. There was not much space out there. Not much of scoring chances out there. So sometimes you need that break and Gino, he needs a break. He needs a loose puck. And we hope it's going to happen tonight. Q. Coach, you had Alex Goligoski called up, what do you think it means to him to be called up in a Stanley Cup Finals? And you talked about the team concept before. So I imagine he wouldn't be an option or will he be an option tonight? 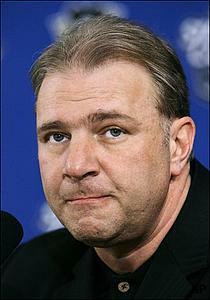 COACH MICHEL THERRIEN: Like Kris Letang, as we all know, went to the funeral of his friend. I think it's the right thing to do, even though it's the Stanley Cup Final. And we called up Goligoski just in case something happened. Letang is supposed to arrive this afternoon. We didn't want to take the risk. If something happened at the morning skate or this afternoon, we didn't want to get caught with six defensemen only. In the meantime, Goligoski is playing really well. He's a great young prospect, and to get the feel for the Stanley Cup Final is great for him. Q. How do you think your young team has handled the Stanley Cup Final experience, just being involved in it, the pressure, the intensity of it all? COACH MICHEL THERRIEN: They've been good. We have young stars. Obviously, it was new, on their own playing against a team that didn't know much. But I thought our two games at home, they played great. They played great. We deserve to win the first game. The second game it could have gone both ways. We're playing against the best team in the League in the regular season, and what I like about our team, we're getting better every game. So that's a great sign. And for a young team, I believe they've been pretty good.